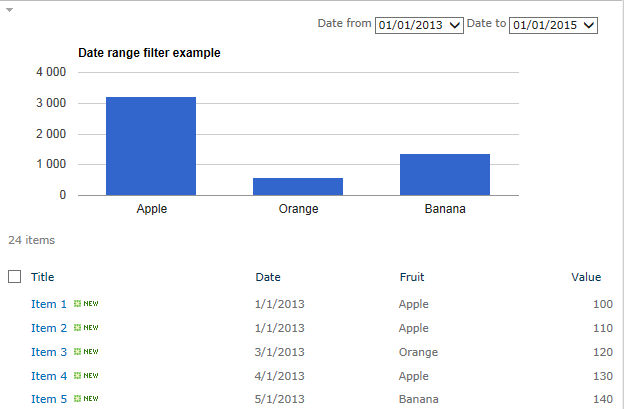 In this article I will show you how to add a date range filter to a chart created using SPJS Charts for SharePoint v4. The code demonstrated below will query the list and get the highest and lowest date in the field specified in the query. It will then create the filter dropdowns based on the interval you select. Currently you can use “m” for month, or “y” for year. 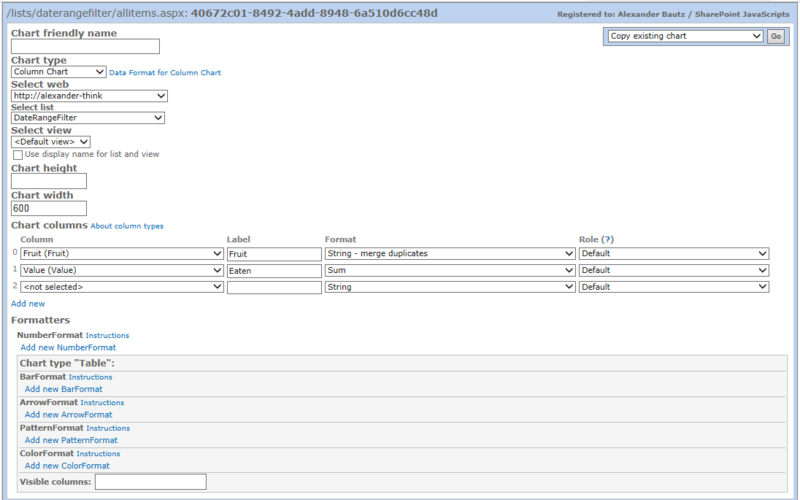 The variable “myCustomFilterOptions” is used in the filter textarea in the chart. You can name it anything you like, preferably something that identifies the filter. list: The DisplayName or the list GUID of the list you are querying. field: The field internal name of the field – must be type “Date and time”. interval: The date interval for the filter. Use “m” for month, or “y” for year. format: The format of the visible date in the dropdown. Use any combination of dd (for day), MM (for month) and yyyy (for year). Look her to learn how to find the list GUID and the FieldInternaleName. Please note the name of the variable “myCustomFilterOptions” from the CEWP code. You must change the name of the filed to match the FieldInternalName of the field in your list. Leave a comment below if you like it, or you need help setting it up. Use “allowEval = true” in the Master Web Part CEWP code. Whet does the alert read? 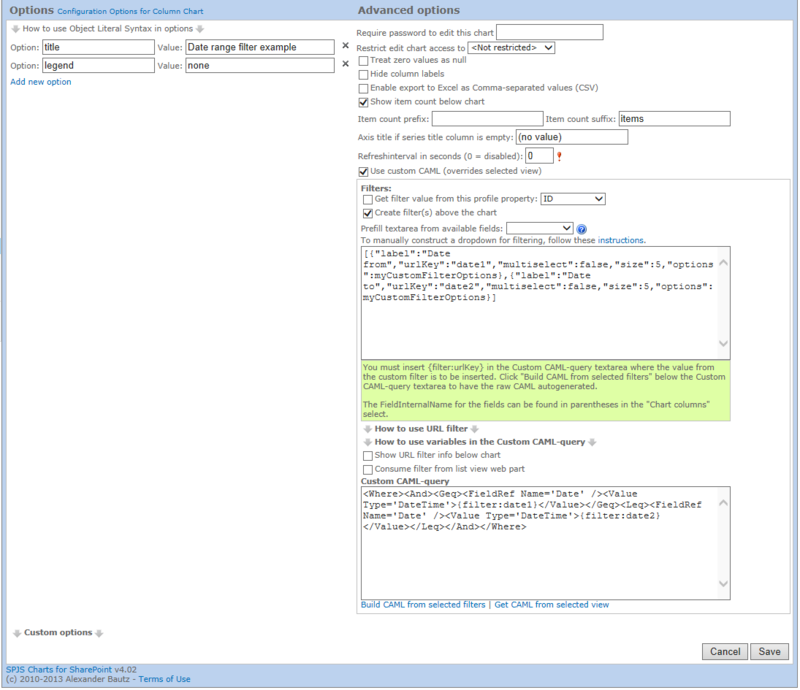 If it is “undefined” you have an error in the query and must verify the list name and the FieldInternalName. Thanks for taking the time to help me. I placed the code within the script and did not get the alert, however when I debug the scrip, I see the following error: “SCRIPT5009: ‘spjs’ is undefined”. Sorry for the late reply. You must reorder the scripts in the CEWP so that the reference to spjs-charts-v4.js is placed above the script block where you are using “spjs.charts.qItems”. Worked. Thanks for all your help. How do you get around haivng to specify a filename? What if I want the form to work like a list form when the user fills it out and clicks okay, it goes into a list. I know you can do that with content types and lists, but can you do it with an infopath-built content type? I’m not sure what you mean, but I cannot help with infopath. I’m having some trouble using the filters as above. I’m using almost everything as you have posted as is, with the following modifications. The filter appears to load correctly except that once I change the filter range from the default, it sits on ‘Filtering…’ and I receive the below error in the Chrome console. Do you have any idea what this might be about? It’s a fairly large list of 1000+ items. Oops, I see that didn’t all post correctly. The relevant change to the CAML is below. Sorry for the late reply. It sounds like you are not using the latest version? Can you verify that? That was the issue. Somehow I was on 4.05 when I thought I was on the latest. Sorry to have not checked this myself! Thanks for your time. I am trying to figure out the differences between the OOB Chart Web Part and your SPJS Chart Web Part, is there any section of your blog that details the differences? Sorry, there is no such comparison table. I have always used the foundation version of SharePoint and I’m not that familiar with the built in charts. Hi Alexander – I was able to get the date range filter set up and working. I have set the range to be by month. Currently, when the page loads, the chart filters to the earliest month in my list. I would like it to default to the most recent (latest month). Is there a way to accomplish this? Thank you so much for all of your work on this. Note that “Ascending” is FALSE. I have not tested this so let me know how it works out. Unfortunately that solution did not work for me. The dropdown then only showed the most recent month, but no other options. What did work for me was modifying a line in the text file from return b; to return b.reverse();. I was then able to modify the function to show the start date of current month and end date of current month +1. Thank you for your help with this. some of my date fields are blank. would this cause the error? If yes, how could I get around that so it would throw an error? You must check to see if the value is null – and skip these lines when building the “object”.